Officers recovered a vast cache of weapons including an anti-aircraft gun capable of firing 800 shots per minute, a number of rifles and an array of ammunition. They believe the haul belongs to a group allegedly linked to the powerful Beltan Leyva drug cartel. 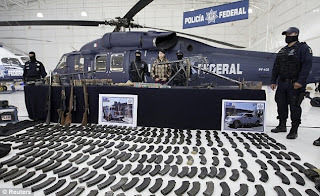 Large swathes of Mexico have been ravaged by violence with drugs gangs battling for territory. Last month, 2,000 soldiers and armed federal police were deployed into the border town of Ciudad Juarez to restore order to the country's most violent city. 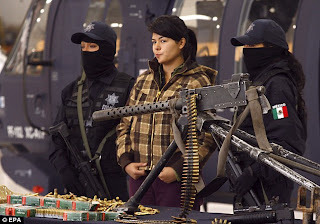 In one month, 250 people were killed by hitmen fighting for lucrative smuggling routes.